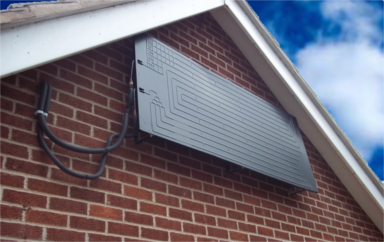 Thermodynamic panels are a new type of panel which can provide both water and space heating. Thermodynamic panels work by absorbing and transferring into fluid the heat in the air or solar radiation striking the plate directly. This fluid is then passed through a compressor which increases the temperature. The heat can then be used in space and water heating systems. These are placed upon the roof like normal solar panels, but in terms of technology they are actually closer to air source heat pumps, since they do not collect sunlight but heat from the air. 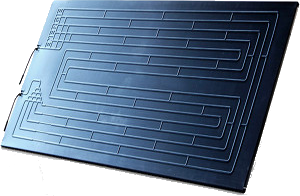 This type of panel is in theory able to produce much more heat than conventional flat plate or evacuated tube solar thermal panels, since it can operate 24 hours a day, absorbing heat from the air. They can also absorb heat even on cold days. Given the fact that electricity is needed to run the compressor, there will be operating costs for thermodynamic power. It is estimated that it will cost a few dollars per month to power the compressor. Tests are in progress, however current thermodynamic panel technology has not proven to perform fantastically during the colder months in certain regions of the US. This is because they rely heavily on the sun to elevate the temperature of the collector to increase the system COP (efficiency). Are Thermodynamic Panels worth installing? For low temperatures especially below 5oC the thermodynamic systems have actually proven to be inefficient (using more electricity to run the device than it would take to heat the water directly). It is highly advisable to wait until the full year-round tests are complete to better gauge the overall performance and effective use of this technology, especially here in the UK. Please be cautious of any claims being made by sales people over their current performance as they may well be unsubstantiated.